When Should I Buy My Train Tickets for Italy? 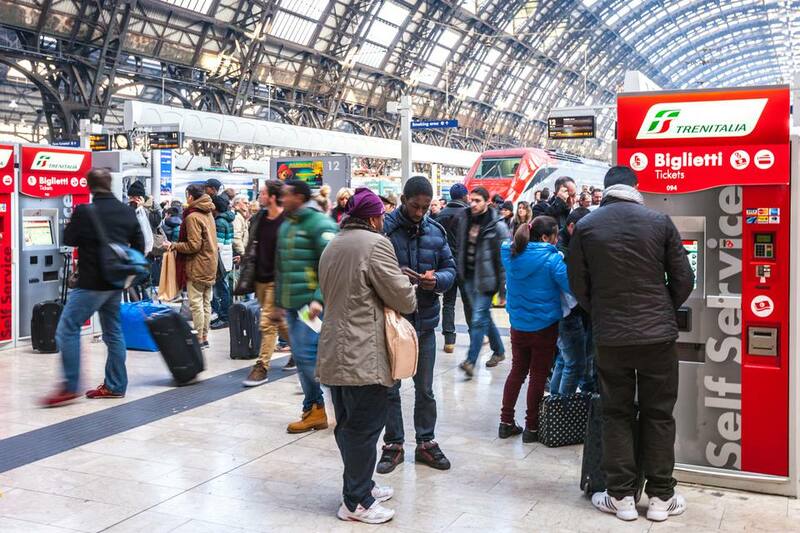 Travelers to Italy often ask why they can't buy their Italian train tickets six months in advance or whether they need to buy them ahead of their train travel date. The answer is different for tickets on each type of Italian train. Tickets for Frecce trains, high-speed trains that run between Italy's major cities, can usually be bought within four months of your travel date. Discounts are often available on fast trains for advance purchases, same day return, or for groups of three or more but note that some discounted and advance tickets may be non-refundable or non-changeable so check carefully before you buy. Frecce tickets can be bought at any train station Biglietteria in Italy. Online e-tickets including seat reservations can be bought through Rail Europe. Important: Seat reservations are mandatory on Frecce trains. E-tickets or tickets that have the seat reservation on the ticket do not need to be validated but if you have a ticket and a separate seat reservation you should validate your ticket. Intercity and Intercity plus train tickets currently can only be bought within four months of your travel date. There are sometimes discounts available for purchases from a month up to a day before your travel date or for group travel but note that some discounted tickets may be non-refundable and non-changeable. Intercity train tickets can be bought at a Biglietteria in any train station in Italy or online through Rail Europe. Important: Seat reservations are mandatory on Intercity plus trains and on most Intercity trains. Be sure to validate your ticket before boarding the train if your ticket is not for a specific date and time. If the seat assignment, time, and date are printed directly on the ticket you don't need to validate but if you're not sure it's best to do it or ask. Tickets for regional trains, slower trains that stop many places along the route usually within one region, can be bought within four months of your travel date. There is rarely any discount for buying a regional train ticket in advance. A regional train ticket does not have a specific date or time, it is valid for two months from the date of purchase for that train route. Exception: If you buy your ticket from a ticket machine at the station, it may have a date and time stamped on it. Regional trains do not have assigned seats so if you're traveling during peak commute times you may want to buy a first class ticket to have a better chance of finding a seat. You can buy your regional train ticket at a Biglietteria in any train station in Italy or a ticket machine at your departure station right up to the time of departure. Important: You must validate your train ticket before boarding the train or you may be fined. The machine may look like either of the photos on this page. Tickets for the private Italo Rail Line that serves some of the major cities can be bought a little farther in advance, sometimes up to five months ahead, with discounts usually available for advance bookings. Tickets can be bought at special booths in the train stations served by Italo or purchased through Rail Europe. Important: You must have your rail pass validated within six months of purchase by a railway official at a train station. Reservations and supplements are not included in the pass and must be purchased separately.